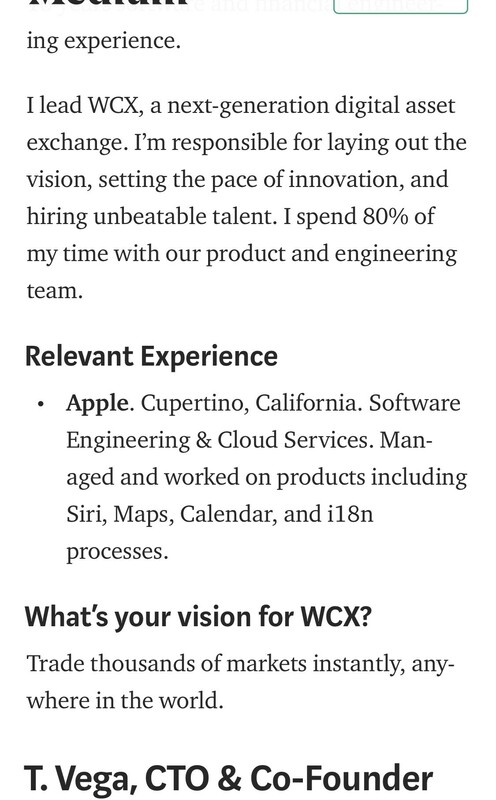 WCEX IS LIKELY TO BE A SCAM. I have been suspicious of this ICO from day 1 given that they did not provide a team, no technical white paper and it was very much all hype. 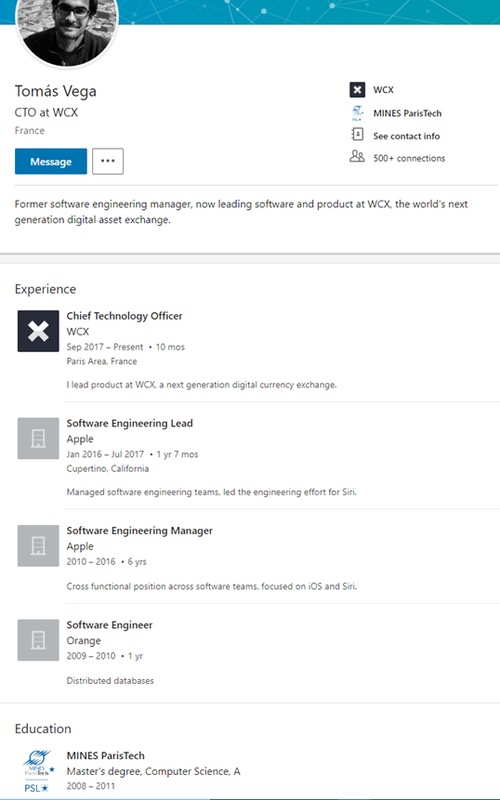 Now that WCEX have passed the stage of pre-ICO during which they raked in 16m USD and have moved on to the ICO, they have actually “revealed” two team members (Anthony Burns and Tomas Vega). 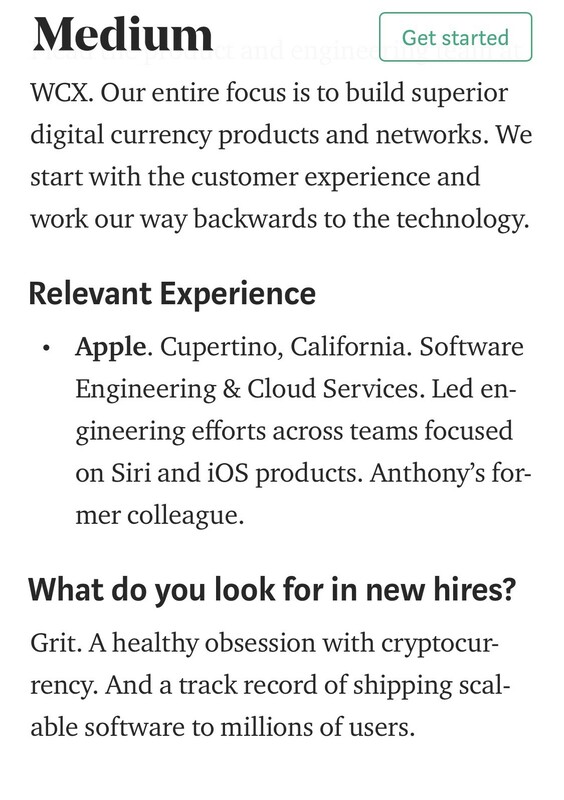 I have screen shot the LinkedIns here at the end so we do not lose them (good thing I did: after my call to apple legal the two profiles are gone. Surprise surprise). 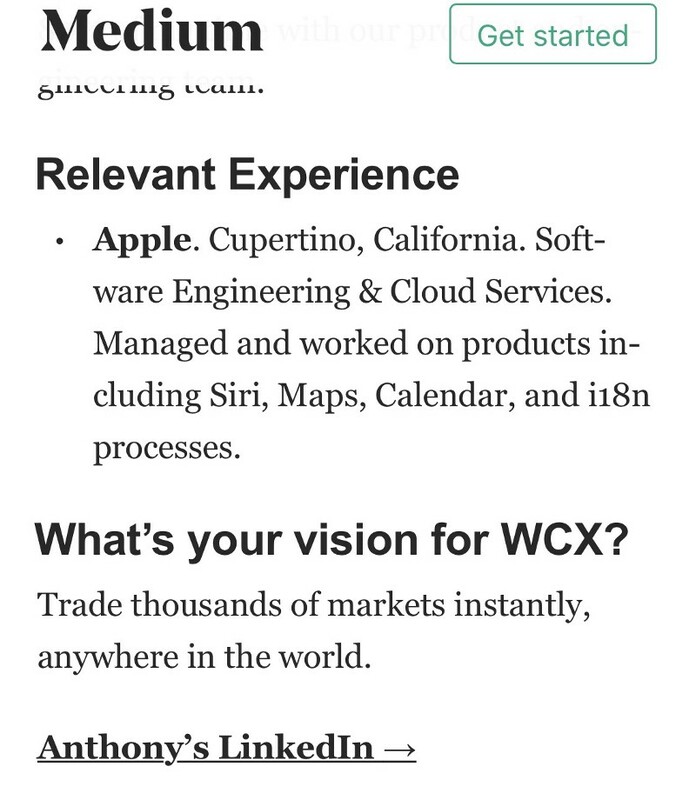 They are using the medium account @wcxofficial. 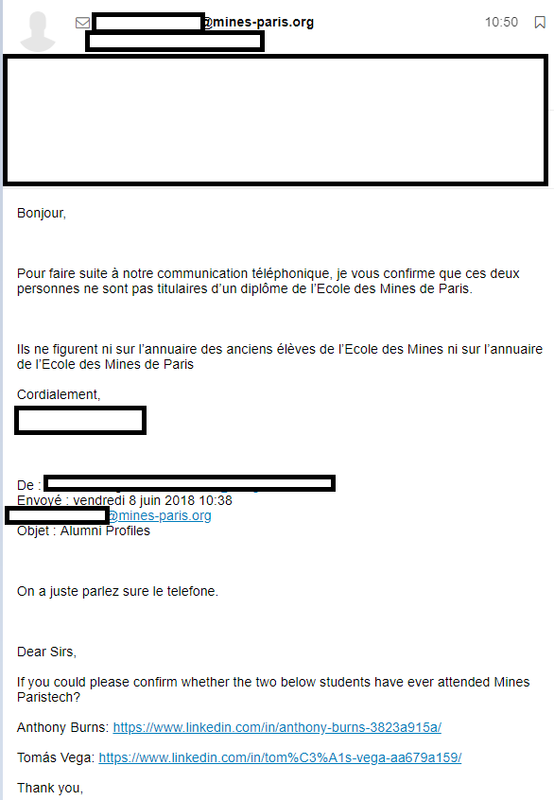 For those of you who do not speak French it says: Regarding our phone call just now, I can confirm those two individuals do not hold a diploma at our school and they are not in our records of former students. 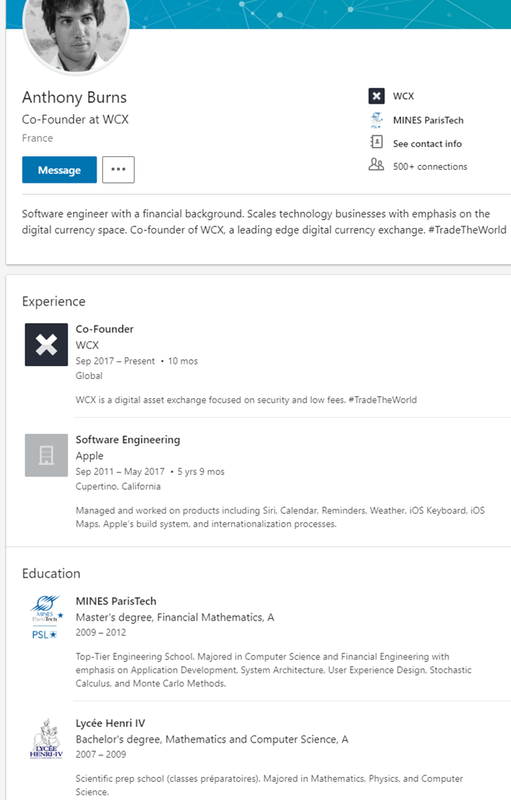 Update: the linkedin profiles have been removed both from their own blog (!) as well as the below links. If you cannot see that these guys never worked at apple and are master scammers then you are simply too greedy to see. The rest below here is much less relevant. I am not claiming those points to be fully evidenced. Just remember, the above is fully enough to show these are scammers. They made up CVs or stole identities to get your money. Remember that when you look at the rest and maybe find one or two points on the list below you find questionable or not so bad. 3. The Tomás Vega that worked on SIRI and has a patent on it works at MIT. 4. As per the below article, the “exchange” they showed earlier (during the pre ico) is an API call to tradingview; not sure if the current one has an engine. Some further interesting points in the article. Note: this is not my article. I am not claiming their exchange won’t work today. 7. Finally just as a throw in: they actually plan to SELL all UNSOLD token from the ICO at market prices after the ICO. Translation: after ripping off people for millions of US Dollars, we will then dump the unsold token on our ICO holders day one. 8. Google searches and backwards searches using their linkedin pictures do not yield anything useful (aside from people who are clearly not these two). That is extremely unlikely if they worked where they say they did. 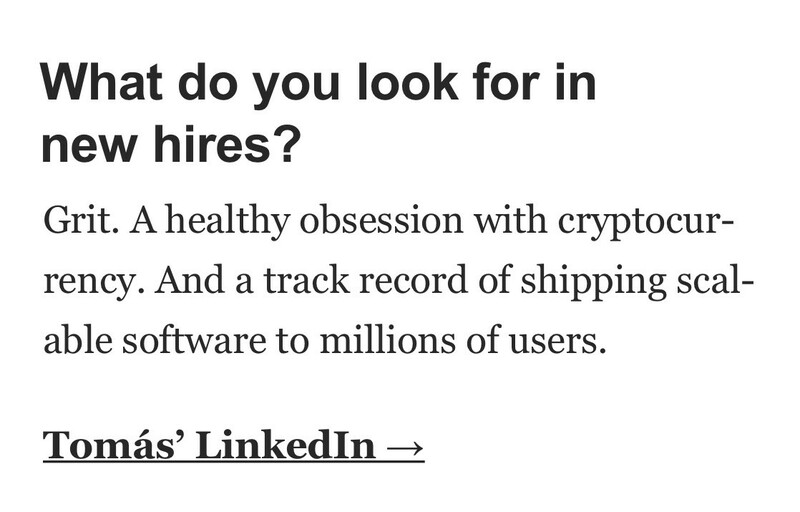 Just to be clear: the fact that both list an institution on their Linked In CV that confirms officially that they have never studied there is enough to tell you that this is a fraud. That action alone is a legal offense. You do not need any of the other points. I do hope that the crypto community starts helping authorities to uncover such frauds. 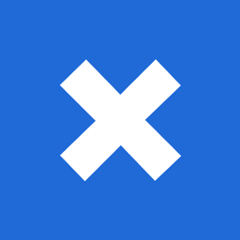 Here is how this will play out in my opinion: token will be awarded, the exchange will be full of bots, actual volume will be de minimis (if at all) and the price of XT token will drop below the ICO price within the first 48 hours. Everyone buying in the ICO will lose money; pre ICO buyers might make a little. Enjoy everyone. A short disclaimer: The above is merely opinion, never financial advice. 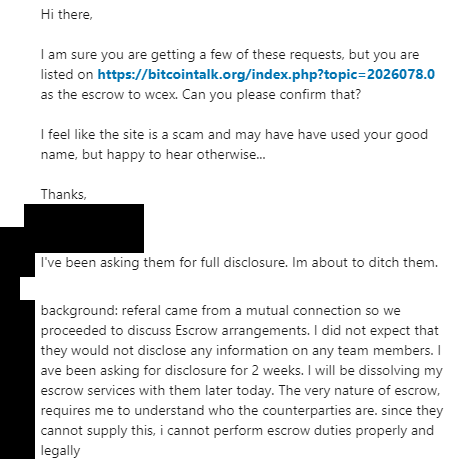 I have not got the time to dig very deeply into this issue, but I believe that the conclusion this project is a scam is valid based on what myself and others have uncovered and is linked here. If I should be wrong then I apologize, but the facts speak for themselves. If you have a university on your CV that confirms you were not a student there then there is hardly a different conclusion to draw.